Today I experienced pure, unadulterated chocolate. 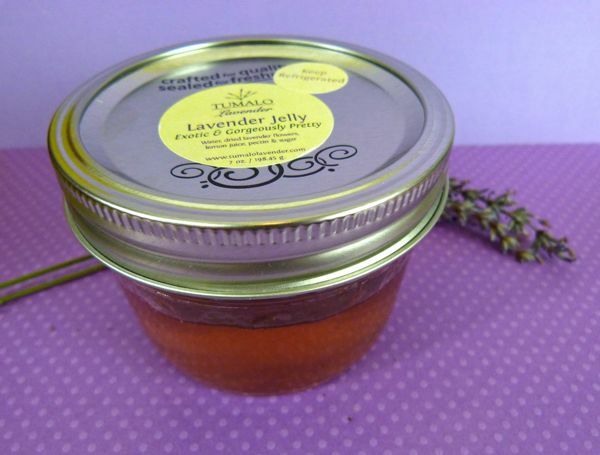 And then I mixed it with pure lavender. I love short ingredient lists. 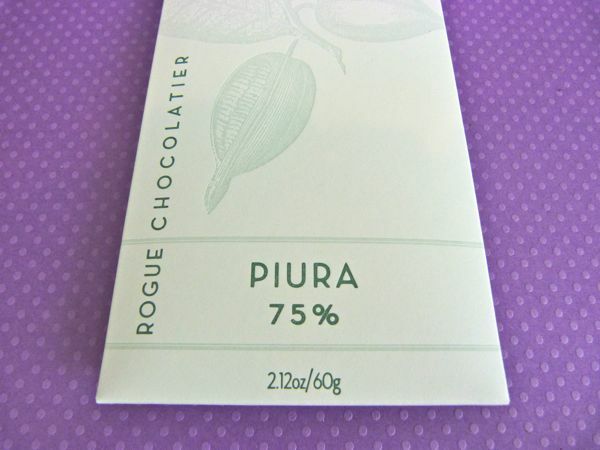 The Piura 75% cacao dark chocolate bar from Rogue Chocolatier (Three Rivers, MA) had just two simple ingredients: cacao beans (from Peru) and cane sugar. 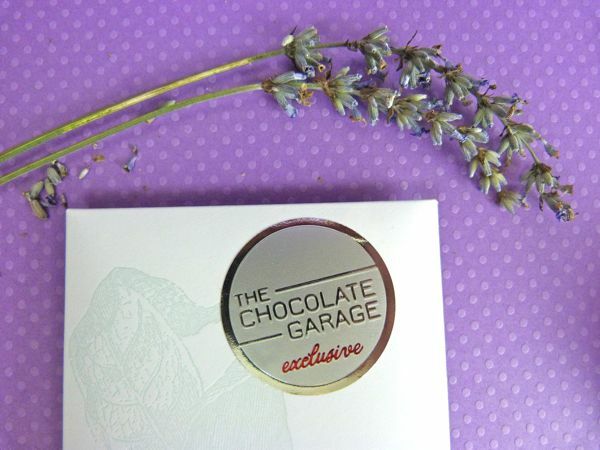 This bar, an exclusive I obtained by being a future chocolate holder at The Chocolate Garage (Palo Alto, CA), was smooth and uniformly great, with enough of an acidic bite to keep it interesting. This simple, unmarked bar was just the right thickness to access flavor notes. 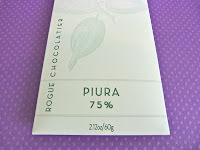 Tasting notes listed on the packaging for Piura: "molasses, tea, dried apricot." I agree with the dried apricot and the molasses. Not sure about the tea, which I sometimes associate with heavier tannic acid. 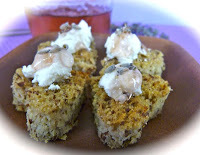 First, I broke off a few small pieces -- that yielded with just the right amount of snap. I ate these plain. 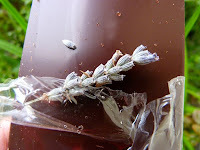 Next, I took the bar outside into the yard, where it was raining, to try it with some lavender flowers I'd picked earlier. Again, just some dried lavender flower buds; nothing else. 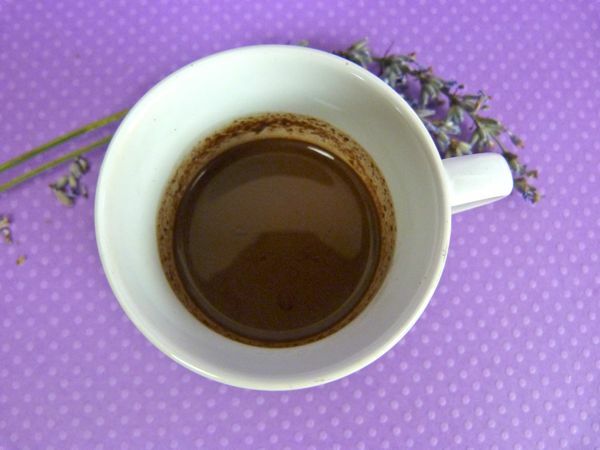 Then I melted a half dozen small pieces of the Piura bar with a tablespoon or two of water in an espresso cup in the microwave, to make some drinking chocolate. Don't try this with just any dark chocolate bar; you may end up with a lumpy mess, in part due to the fact that most bars contain a long list of additives. Last, but not least, I enjoyed this micro-serving of smooth, rich and delicious hot chocolate with gluten-free toast, goat cheese, and rose-colored Lavender Jelly from Tumalo Lavender (Tumalo, OR). Best snack plate I've had since chocolate and fig week. Today was Day #7 of Chocolate and Lavender Theme Week.